ENTER A TEAM IN THE 2019 STAFF SUSTAINABILITY CHALLENGE. Bragging rights and awesome prizes on offer. Green Impact @JCU is a fun, new staff sustainability program. It is an enjoyable and interactive way for staff to engage with each other and become more sustainable at work. In 2018, TropEco surveyed JCU staff to find out about their attitudes towards sustainability. The main feedback we received was that staff want to be more sustainable at work and that they want more opportunities to engage in sustainability. We believe Green Impact is an excellent way for this to happen. 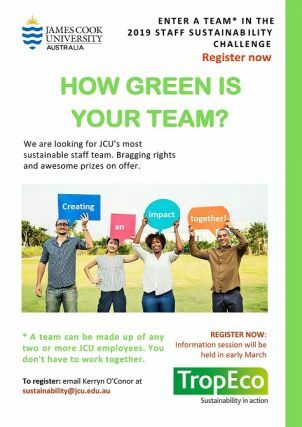 To resgister a team, email Kerryn O'Conor, Sustainability Officer at sustainability@jcu.edu.au. Kerryn will then get in touch with you to provide you more information about the program, including how to access the online toolkit you will be using to log your sustainability actions. We are holding an information session on the 13 March to run through the program in detail, including the online toolkit. Staff form teams of 2 or more people - teams can be made up of people you work with directly or friends / colleagues from other work areas. Each team chooses a range of sustainability actions they want to achieve throughout the year from an online toolkit, specific to JCU. We will train you on how to use the toolkit before you begin. There are different levels of actions you can take, from small changes to harder activities, and it is completely up to each team to decide what level of accreditation they want to go for. You log your actions using the online toolkit. Your team’s ‘score’ is then automatically updated live through the toolkit and an online scorecard allows you to see how you are travelling compared with the other JCU Green Impact teams – a bit of fun competition! A great part of Green Impact is that it also provides the opportunity for students to engage with staff in a different way. The toolkit gets closed off at a predetermined date later in the year and student auditors are then engaged to audit each staff team. We provide accredited training for the students in this role. Teams will receive support every step of the way and will be recognised for their efforts at an award ceremony later in the year. Green Impact was originally developed by the National Union of Students (NUS) in the UK. It is being delivered in Australia by the Australasian Campuses Towards Sustainability (ACTS), of which JCU is a founding member. The program was first trialled in Australia by the University of Melbourne in 2017, and in 2019, there are 13 universities from Australia and New Zealand participating in Green Impact. You can go to the ACTS Green Impact website to see more about the program and how it is being delivered nationally. Also, check out the University of Melbourne's Green Impact page - with 2 years under their belt they have some great examples of different sustainability actions their teams have undertaken. ... we think that JCU can out compete all of them though!